I picked this book off the library's "New Book Shelf" off of impulse. I was tired of reading fan fiction and I needed something new and fresh, something I hadn't heard of before. Don't Stop Now seemed like a good pick. A short book about a girl and her best friend who she's in love with as they travel across the country looking for Penny, a girl they knew who faked her own kidnapping. As much as I wanted to love this book, it reminded me too much of John Green's An Abundance of Katherines, maybe the only other road trip book I've read. (Is it just me, or do they all seem the same?) Two people, looking for themselves and something or somebody else as they drive across country unannounced. 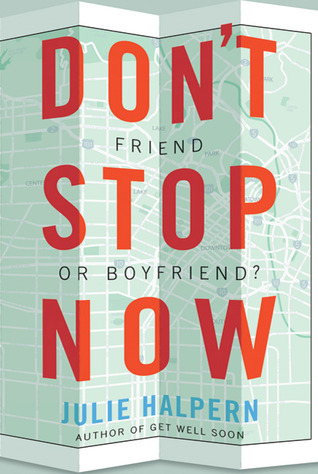 However, although An Abundance of Katherines engaged me from beginning to end with its witty humor and insightful teenage philosophy, Don't Stop Now did not. I think it was trying to hard to be interesting. While the cheese themed shirts, the crazy hotel rooms, and the House of Rock were all interesting, there was too much quirkiness, quirkiness overload. As they tried to deal with Penny's antics, sort of new boy friend in Seattle, and her troubled past, they have to deal with their own uncertain future and her hot best friend Josh (who by the way is shirtless half the book) and hi's daddy issues. Oh, and I kinda had a problem with the ending. I know it's meant to be like that, to let us know that the future's uncertain, la-de-dah, and all that, but I like myself a bit of closure if you know what I mean. In the end, I loved the humor and the characters were likable enough. I didn't have a problem with the writing, but I though that it lacked the wit to be remarkable and the plot to be amazing, thus the 3.3. Despite that, I don't regret reading it. It's one of those books that leaves you feeling happy and warm inside, while at the same time, makes you think about what you want out of life and whether or not Wisconsin cheese is really as good as they say it is.